SPECIAL OPERATIONS FORCES INDUSTRY CONFERENCE (SOFIC) 2018, TAMPA, Fla. (Booth #1919) – May 21, 2018 – Curtiss-Wright’s Defense Solutions division today announced plans to introduce a family of commercial-off-the-shelf (COTS)-based modules and LRU solutions designed for system integrators seeking to rapidly and cost-effectively deploy Assured Position, Navigation and Timing (A-PNT) services to ground vehicles operating in GPS-denied environments. Building on its current PNT solutions, the DBH-672 Digital Beachhead and DBH-670 Digital Beachhead Rugged Switch, Vehicle Processor and Assured PNT Systems, Curtiss-Wright is developing the new VPX3-673 A-PNT card, a high performance single board computer. The rugged VPX3-673 will speed and ease the integration of Complementary PNT sources on ground vehicles. It will deliver state-of-the-art technology services, including a GPS Receiver (SAASM GB-GRAM Type II, upgradeable to M-Code), Chip Scale Atomic Clock (CSAC), and an on-board Inertial Measurement Unit (IMU), to eliminate the need for multiple in-platform boxes or the use of “bolt-on” technologies in order to field new Navigation Warfare (NAVWAR) capabilities. Curtiss-Wright also announced today an enhanced version of its DBH-672 Digital Beachhead. The new DBH-672A Digital Beachhead, a fully integrated rugged LRU, adds support for a GPS Receiver (SAASM GB-GRAM Type II, upgradeable to M-Code), CSAC, and IMU to the earlier model’s built-in VICTORY infrastructure switch and shared processor unit features. Curtiss-Wright’s A-PNT solutions are designed to provide ground vehicles with access to trusted PNT information while operating in conditions with limited, impeded, or denied GPS. Based on open-architecture, COTS technology, Curtiss-Wright’s 3U OpenVPX module and fully integrated rugged LRU A-PNT solutions are cost effective, simple to configure, and rapidly deployable. As well, these A-PNT products are SWaP-optimized for both combat and tactical wheeled vehicle platforms to ease the integration of software and hardware elements required by the warfighter to effectively conduct operations in a GPS-denied environment. 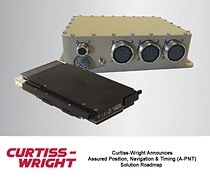 By distributing the best available PNT data simultaneously to multiple platform applications that require GPS data, Curtiss-Wright A-PNT solutions eliminate the need for a ground vehicle to support multiple GPS receivers or antennas. Curtiss-Wright’s A-PNT solutions meet legacy GPS distribution requirements and are compatible with standard DAGR accessories, such as RA-1/RA-2 antennas, Crypto Variable Fill cables, and all serial interface cables. They are designed to support both legacy and future technology, including interfacing to mission equipment, as well as Anti-Jam Antenna and tactical communications. Limited quantities of early access units (EAU) of the new VPX3-673 module and DBH-672A Digital Beachhead unit will be available to qualified customers. Please contact David Jedynak, Director, Curtiss-Wright A-PNT Program Office (djedynak@curtisswright.com).